Generally speaking, you should not meet with an insurance adjuster in an attempt to settle your car accident case. 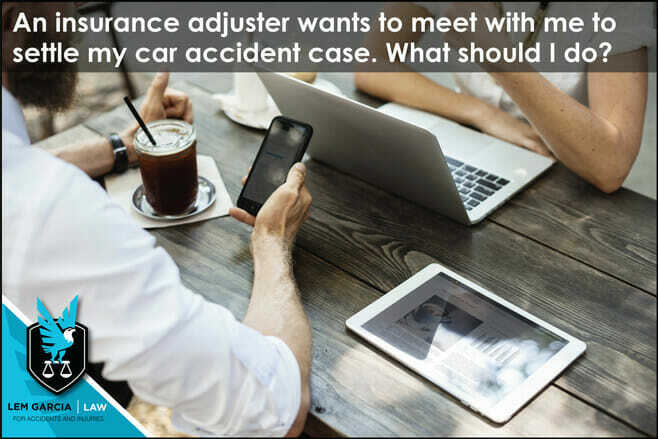 The insurance adjuster wants to meet with you to reduce the value of your claim. The adjuster is not there to write you a big check for what your case is truly worth. The insurance company wants to pay you as little as possible as quickly as possible. If you think that you were not injured in the crash and you just want to settle your potential case for whatever the insurance company is offering, it is prudent to wait several weeks before signing any bodily injury release. It is a good idea to make sure that you are absolutely 100% fine before signing any bodily injury release because once you sign, you will no longer be able to pursue your claim. It is very common for your neck, back, or any other type of pain to present itself days or even weeks after a car crash. Many people do not feel pain immediately after the crash or even several days after the crash. Even if you want to accept what the insurance company is offering, it is a good idea to find a personal injury attorney to speak to. Many personal injury lawyers provide free advice to people who have been injured in car accidents because we do not want to see people get taken advantage of by the insurance company. At Lem Garcia Law, case consultations are always free and we are happy to help you with any questions you may have. West Covina car accident attorney, Lem Garcia, will give you information no matter how big or small your case may be.